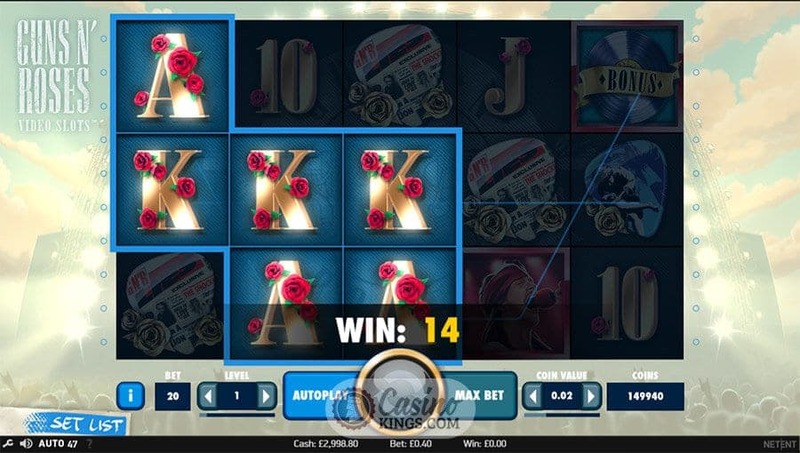 2015’s London ICE gaming showcase was treated to a real touch of rock and roll when Net Entertainment announced of the launch of its Guns N’ Roses slot. Though NetEnt missed a trick by not having the CEO come out to make the announcement in skin-tight leopard print lycra and surrounded by dry ice, they definitely did not miss a trick when it came to devising this five reel, 20 payline title that boasts almost as many bonus features as Guns N’ Roses had hits and proves that good things do come to those who wait. 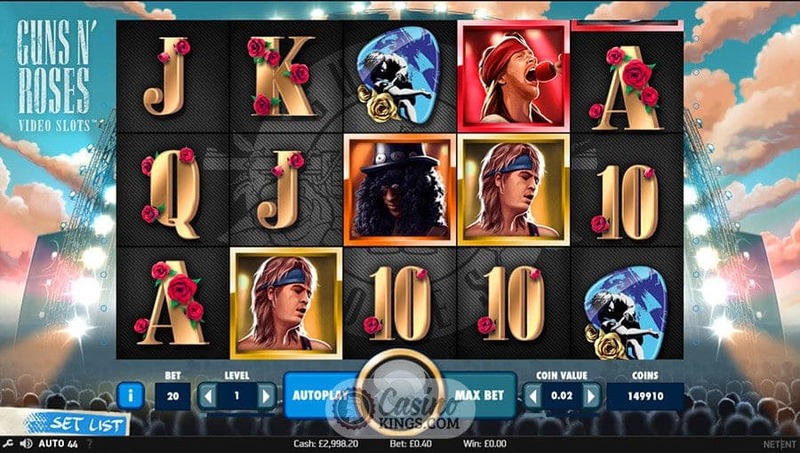 Just like many tracks penned by the iconic rock band, the Guns N’ Roses slot from NetEnt begins with an awesome intro to the tune of Sweet Child Of Mine. Right from the off we become part of a tribute to one of the greatest rock bands of all time, topped off sweetly by our ability to choose our own set list for our game play from a selection of classic Guns N’ Roses tracks. 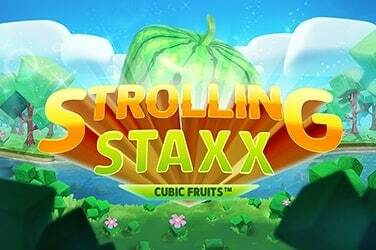 The reel case sits in front of stage below a sunset sky, rock fans bobbing to the classic hits as we spin our five reels in search of big wins. Though we might expect slightly more moshing action at an actual gig, this crowd doesn’t distract us from the slots action but sets the scene nicely. The game’s high symbols are the band members Axl, Slash and Duff McKagan, all founding and current members of the band artfully drawn and brought to life by NetEnt’s artwork team. Low symbols are golden 10s through Aces given a stylish twist and adorned with roses. 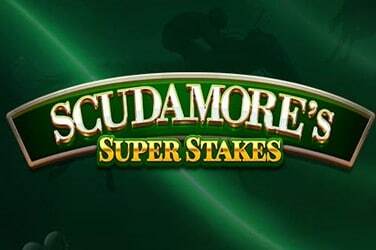 Aptly enough, the Band Logo is the game’s Wild symbol, going crazy on the substitution duties by expanding across the reel when completing winning paylines. 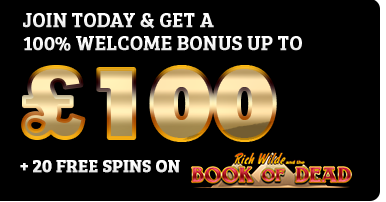 The bonuses in the Guns N’ Roses slot have as much chance of getting in America’s Hot 100 as any single released by the band – purely due to the numbers of them! 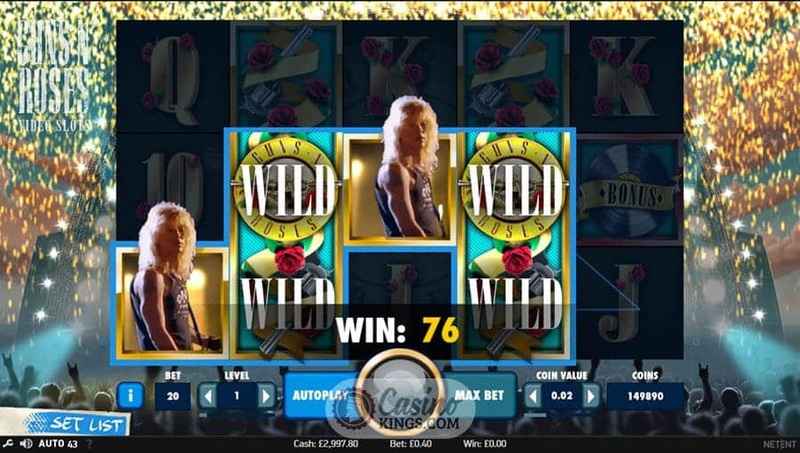 Guns N’ Roses boasts an incredible SIX bonus features – the Bonus Wheel (triggered by landing three bonus reels on reels 1, 3 and 5) feature, the Crowd Pleaser Bonus Game (a 3 level pick-and-click bonus feature) and the Encore Free Spins (featuring a band member overlay Stacked Wild on reels 2, 3 or 4 on every spin). We are also treated to a glimpse of the impulsive nature of rock and roll life with the randomly-triggered Appetite For Destruction Wild that appears in the shape of a cross to pay homage to the band’s debut album cover. Legend Spins (which awards three spins with Band Member Stacked Wilds appearing across the reels) and Solo Multiplier that brings us a face-melting guitar solo are activated when three matching symbols feature in a winning combination. The fourth reel spins and spins, adding a multiplier as each concurrent matching symbol spins round and beginning to resemble the gate receipts from a Guns N’ Roses gig. Wow. 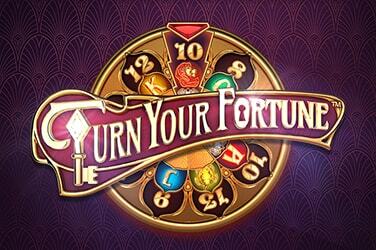 The Guns N’ Roses slot is as breathless and energetic as the band itself. 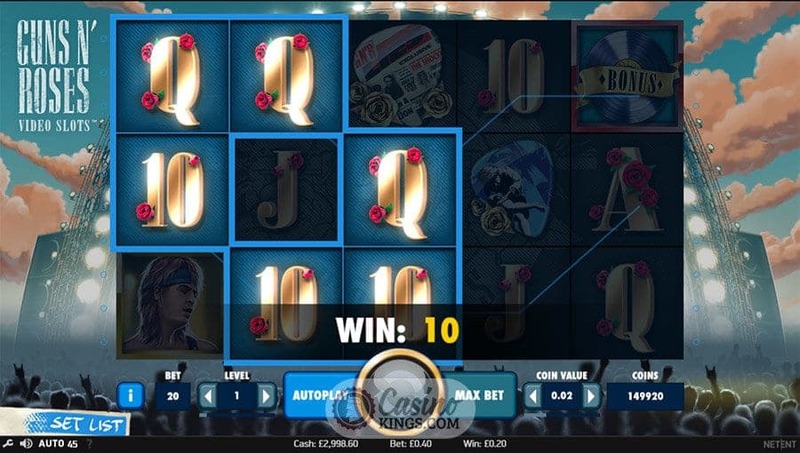 NetEnt’s game design captures the essence of the band perfectly, while the gameplay and bonus features will ensure that this is one slot that will prove as timeless among slots fans as the classic hits created by one of the world’s most prestigious rock bands.